what have YOU – the reader Voted! Survey Target: To Find out and better understand the community that visits, read, follow and draw resources from this site. Sample Size Target: 1000 Entries. Target: To Understand what camera brands the majority uses. Target: To Understand what Brand of Lenses People here owned. Target: To Understand what Typically How Many Brands owned per person. 62% Owns at least 3 Brands of Equipment. 17% Owns 1 Brand only. Question 4: Regardless of brand, Which is your favorite walkabout lens? Target: To Understand which lens are popular and widely used as a “walkabout lens” . Question 5: Regardless of brand, Which is your favorite wide angle lens? Target: To Understand which Wide Angle lens are popular with the people here. Question 6: Regardless of brand, Which is your favorite telephoto lens? Target: To Understand which Telephoto lens are popular with the people here. Question 7: Regardless of brand, Which is your favorite prime lens? Target: To Understand which Prime lens are popular with the people here. Question 8: Regardless of brand, Which is your favorite macro lens? Target: To Understand which Macro lens are popular with the people here. We have 2 Runner-Ups for this category with same number of entries. Question 9: Regardless of brand & focal length, which lens is your dream lens? Target: To Find Out which lenses are the people here dreaming to own. Question 10: Regardless of brand, which lens will you be purchasing next? Target: To Find Out (realistically) which lenses are the people here planning to buy next. 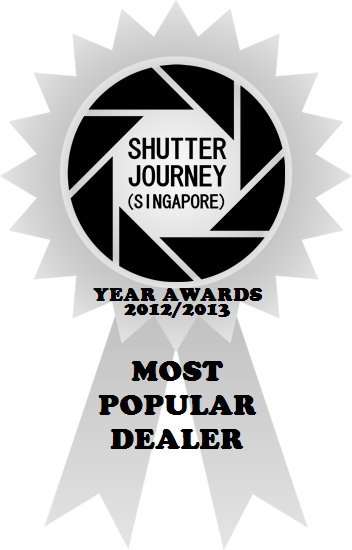 Question 11: List your top 3 favorite camera dealers (shops) name. Target: To Find Out who are the favorite dealers among the folks here. 2nd Runner Up: Cathay Photo Store Pte Ltd.
To Reward the Respondents for this survey, our Sponsors Audio & Photo Distributor (F.E.) Pte Ltd & Sigma Marketing Singapore Pte Ltd will be giving away $100.00 Vouchers to 02 Lucky Respondents. Our Sponsor Representative Mr. Kenny Khaw randomly picked 02 Winners from the 1107 Entries. ****Winners will be Contacted separately for Collection of Prizes! Thank you everyone who made the effort to write in your response and taking time to fill up the answers! and buying patterns from this community. Till the next Year Awards in 2014 where we will run the 2013/2014 series and hopefully we will have more sponsors too! This entry was posted in Blacklisted Shops/ Brands, Brand: Canon, Brand: Nikon, Brand: Olympus, Brand: Others (Cosina, Carl Zeiss, Leica, Mamiya, Samyang, Vivitar, Zenitar,etc), Brand: Pentax, Brand: Sigma, Brand: Sony, Brand: Tamron, Brand: Tokina, Group Announcements & Notices, Photography Articles & Videos, Photography Contests, Uncategorized and tagged SJS Year Awards, Year Awards. Bookmark the permalink. 1 Response to ourshutterjourney.com Year Awards 2012/2013 Winners Announced!